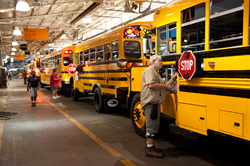 The Blue Bird Corporation, a school bus manufacturer based in Peach County, says greater industry demand over the last four years has pushed its number of employees to over 1,600; a 44% increase since 2010. This number includes a geographically diverse workforce with employees from over 45 Georgia counties. As a leading bus manufacturer, Blue Bird experienced growth in all vehicle segments and expanded its alternative-fuel leadership position, led by the class-leading Propane Vision bus. Propane is the fastest growing alternative fuel in the school bus industry. Blue Bird is the second largest automotive manufacturer in the state of Georgia and the largest manufacturing employer in Central Georgia. Established in 1927, Blue Bird is the largest employer in both the city of Fort Valley and Peach County. The company’s Fort Valley footprint includes two production facilities with over one million square feet of manufacturing and fabrication space.